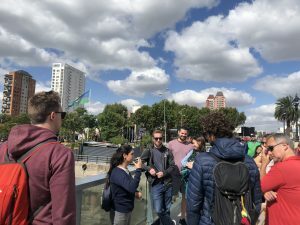 On dia de la Memoria (24th of March), we organized a day-trip for our students to Tigre. We met at Retiro train station at 10.30 in the morning and from there we took off by train which took us about 1 hour. 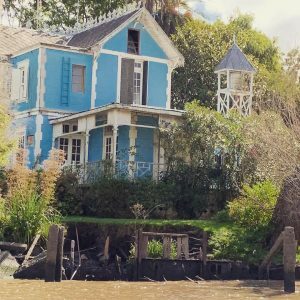 Tigre is a great place to escape the busy city of Buenos Aires for a day or a weekend. 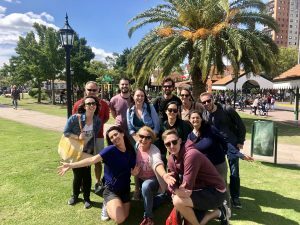 There are several touristy things to do and see, and we were lucky enough to have Angela with us, who has lived in Tigre all her life. When we arrived everyone started to get a bit hungry and thus, we decided to start the day with a nice lunch next to the river. 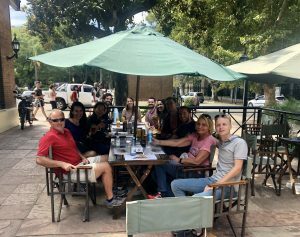 After lunch, we went for a walk with Angie, she explained us a lot about the Tigre and how it is to grow up there as a child. We walked past the river and had a look at the different buildings. The delta of Tigre is famous for their many little islands with houses were people live. We took a boat to see what it looked like and it was very impressive and nice to watch all the different islands with houses in different styles. We were told that it is also possible to rent a house or Airbnb on one of the islands for a few days if interested! After the boat trip, we walked around the market in the centre of Tigre. We ended the day with a drink and made our way home later that night. It was a great day with lots of fun and we can’t wait to go again next time! Take the underground or bus to Nunez train station. Use your subte card to ‘tap on and off’. Tigre is the final stop, roughly 1 hour. The price to go to Tigre is around 60 Pesos there and back. The boat trip cost around 200 Pesos and most of the other activities are free.